EVE Audio - TS108 Subwoofer 8" > Eve-Audio > Diffusion Audio Inc. 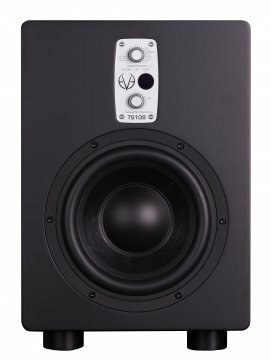 The TS108 model features a very efficient 150W PWM amplifier that drives a proprietary 8" woofer. This guarantees a frequency response of down to 33Hz (on the lower end), up to 300Hz, for a maximum output power of 105 dB (SPL @ 1m). As with every other EVE Audio subwoofer, you get balanced XLR In- and Outputs (Stereo In and Out, LFE In, LFE/Sub Out) for greater convenience. In addition, TS108 features an unbalanced input for connecting SC203, too.